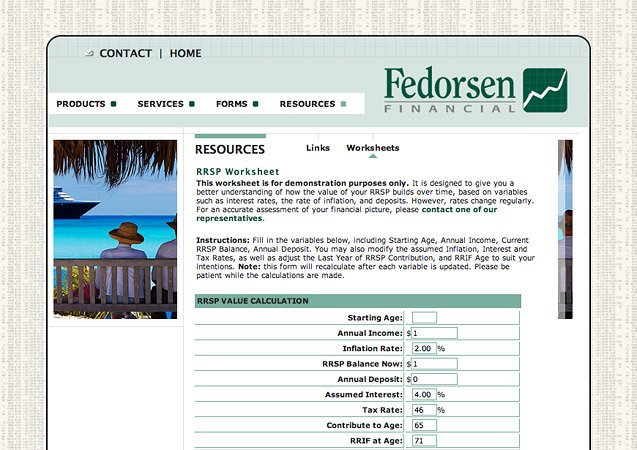 Alembic Interactive : Our Work : Fedorsen Financial Inc.
For Fedorsen Financial Inc., Alembic developed a website to support an existing and prospective client base with estate planning, insurance coverage, and retirement planning worksheets and other information and resources. 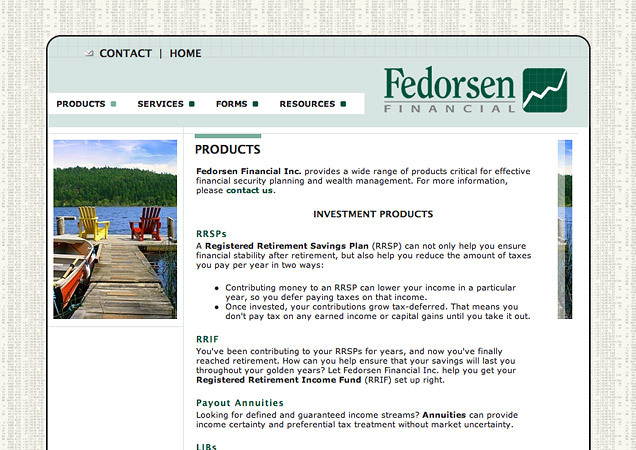 Fedorsen Financial's website provides an online presence for their service-oriented approach to financial advising, estate planning, and wealth management. 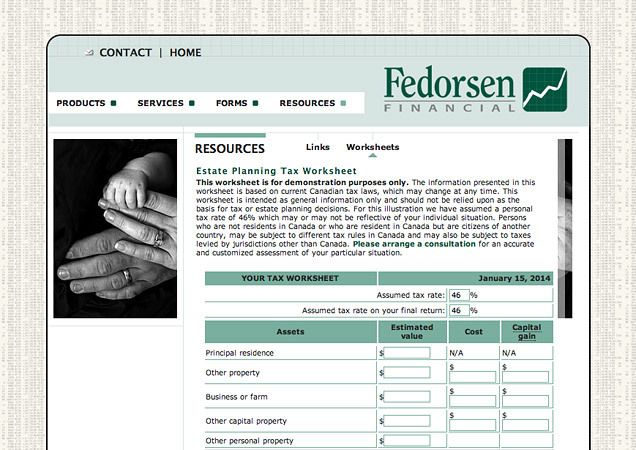 This service-oriented approach is complemented by online RRSP, Estate tax, and Life Insurance calculation worksheets. The RRSP Value Calculator enables current and prospective clients to calculate the terminal value of their RRSP at current or anticipated contribution rates. Starting age, annual income, current RRSP balance, annual deposit levels, inflation rate and interest rate can all be adjusted in order to compare different scenarios. Completed worksheets can be printed for discussion with an adviser. The Estate Planning Tax Worksheet guides wealth management clients through the capital gains and other tax implications of different asset classes under Canada's taxation laws. 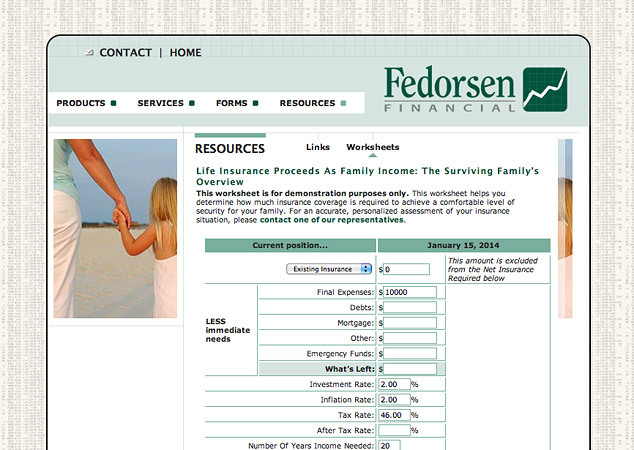 The worksheet provides a starting point for discussion wealth management within families, and with a Fedorsen Financial adviser. The Life Insurance Proceeds Calculator assists families to determine whether existing insurance policies are sufficient to cover immediate capital needs and income expectations. Shortfalls in expected insurance proceeds are used to calculate the additional coverage required for peace of mind.